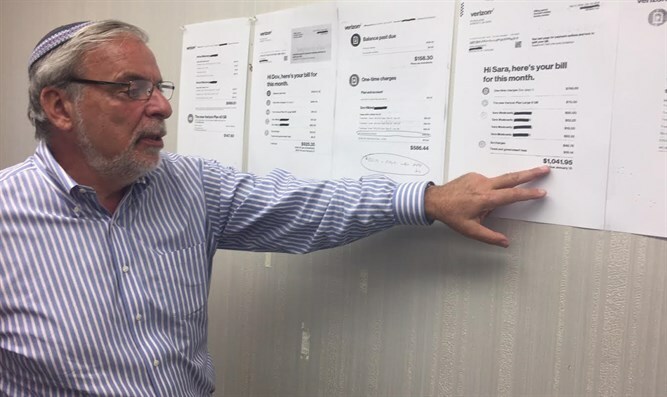 Assemblyman Dov Hikind calls on state AG to investigate company over bait-and-switch scheme, says Verizon systematically cheating customers. A New York State Assemblyman is calling on his state’s attorney general to investigate America’s largest cell phone service provider, following a spate of complaints by constituents that the company was systematically cheating Americans traveling abroad. Assemblyman Dov Hikind, a Democrat representing New York’s 48th district, has asked New York State Attorney General Eric Schneiderman to probe Verizon Wireless and what he calls the company’s “bait-and-switch scam” that has cheated customers travelling to Israel. According to Hikind, constituents who signed up to Verizon’s TravelPass service were subjected to erroneous charges and hidden fees many times higher than the price they had been led to believe they were liable to pay. “Verizon Wireless is blatantly and inexcusably cheating New Yorkers and others who travel to Israel, and one can presume other overseas destinations,” said Hikind. The TravelPass service, explained Hikind, attracts customers because it allows people to use their existing cellular devices overseas. The advertised rate for the TravelPass service to Israel and other destinations is just $10 per day, including phone calls, text messages, and internet. But constituents in Hikind’s district told another story, saying that when they returned home from trips to Israel, they were shocked to find exorbitant bills which included high-priced roaming charges for areas they had neither visited nor received calls from, including Saudi Arabia and Jordan. Nor did Verizon acknowledge the mistake with customers, with customer service representatives insisting the charges were accurate. Most importantly, the company refused to erase the erroneous charges, forcing customers to pay hundreds of dollars for calls they never made. When Hikind reached out to Verizon regarding the issue, a company representative claimed that precautions had since been put in place to ensure that customers would not face surprise roaming charges. But according to Hikind and his staff, Verizon still has made no effort to inform customers of the roaming charges they could face even while remaining inside Israel.